The Museum of Applied Arts in Budapest joined the Google Art Project earlier this year. So far, about 100 objects have been made available in high resolution on the project website - selected from the over 5000 objects already digitized and made available online by the museum. More recently, the museum view function has also been enabled, allowing visitors to look around inside this wonderful Art Nouveau palace of Budapest. 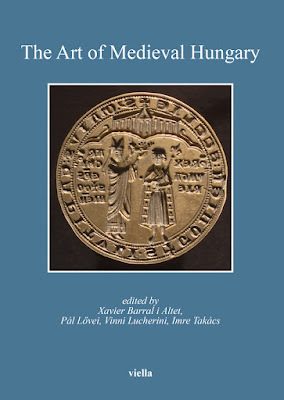 Several medieval objects can also be found in the database. 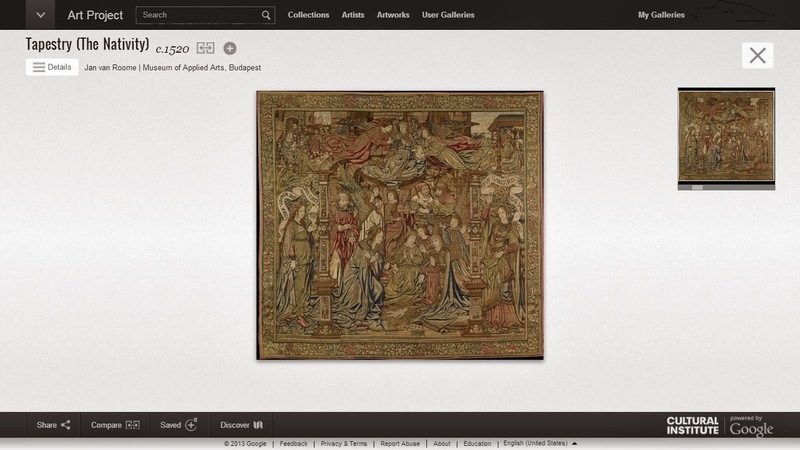 Google digitizes one artwork from each museum with the very high resolution gigapixel technology. When it came to selecting a work from the Museum of Applied Arts, after some discussion with my colleagues, we settled on one of the most spectacular works in the collection: the early 16th century Nativity tapestry woven in the workshop of Pieter van Aelst, and likely designed by Jan van Roome. The dimension and the intricate details of this work made it suitable for the high resolution digitisation - and the results, made available online this week, are quite spectacular. The Nativity tapestry, originating from the cathedral of Győr, is the most important early Renaissance work in the Museum of Applied Arts. Its size is 275 x 260 centimetres, so it is not particularly large. 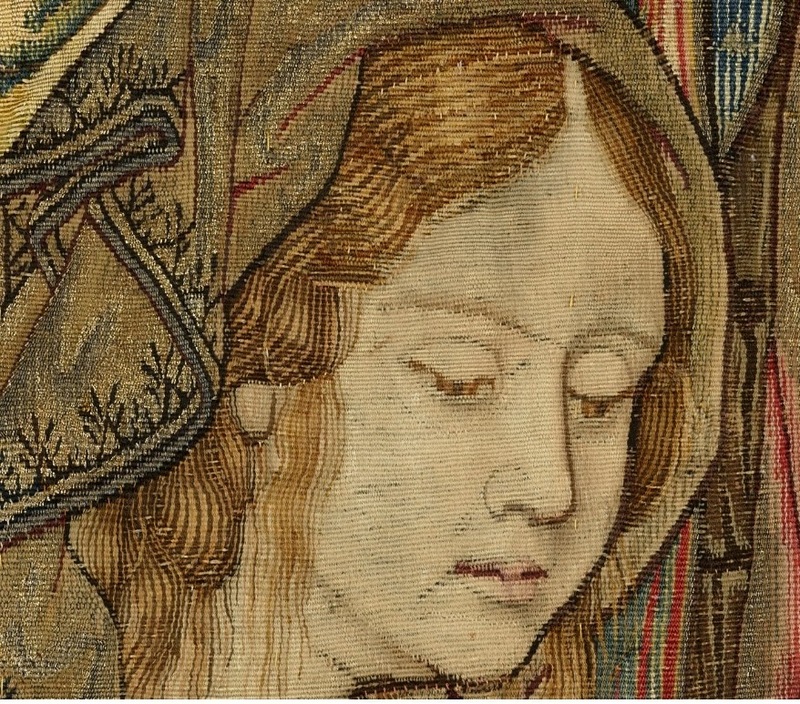 The field of the tapestry is surrounded by a richly decorated border, and is divided into three parts. The large central field contains the principal decoration of the tapestry: the Nativity, or more specifically, the Adoration of the newborn Jesus. The baby Jesus is depicted laying on the ground, her mother kneeling and praying in front of him. Joseph, holding a candle, is depicted behind the Virgin Mary. Several angels also adore the newborn and two shepherds also appear in the composition. The upper part of the image is occupied by three majestic angels hovering above the vision. This type of depiction reflects the impact of late medieval mysticism, particularly the visions of St. Bridget, who died in 1373. The picture type was popular in Early Netherlandish painting since the early 15th century. Two further scenes are depicted in the two upper corners of the tapestry: the Annunciation can be seen on the upper right, while the Adoration of the Magi is on the upper left – both complete compositions on their own. Two decorated Renaissance pillars separate the central scene from further depictions on either side: two Sibyls, holding inscribed scrolls are shown on the sides. Their texts refer to significance and mystery of the incarnation: UTERUS VIRGINIS ERIT STATERA CUNCROTU/M (The holy uterus of the Virgin is the ransom for all of us), DEUS NASCETUR EX VIRGINE HEBREA (God will be born of a Hebrew virgin). The border is decorated with finely composed bunches of flowers and fruits. An exact analogy of the tapestry can be found in the Museo Diocesano in Trento as the first piece of a seven-part cycle mainly depicting Christ’s Passion. The cycle was purchased by Bernardo Cles, the prince-archbishop of Trento (1514 – 1539) from Joris van Lickau, a merchant of Antwerp in 1531. 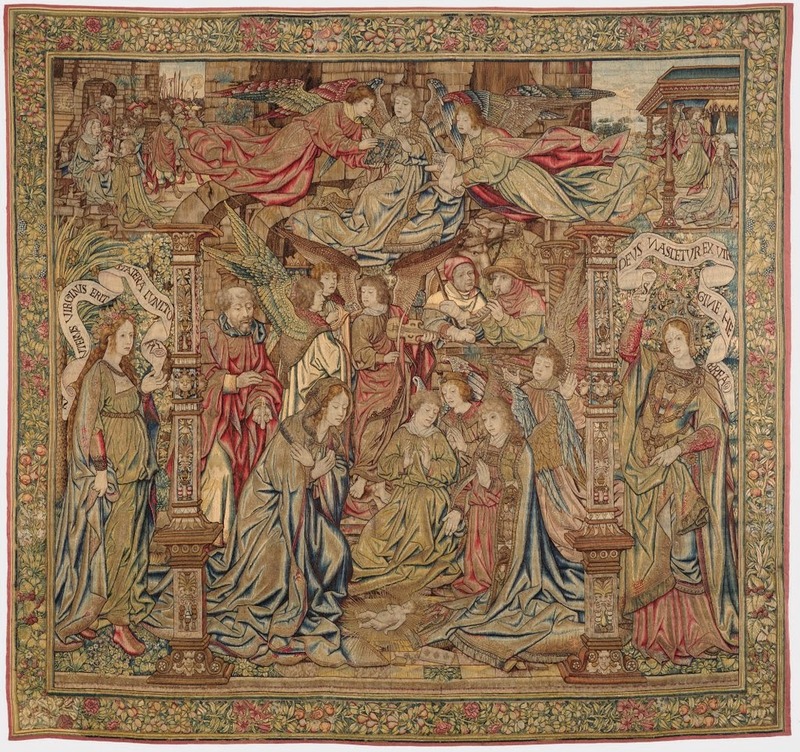 The tapestries were made earlier: the piece showing the Carrying of the Cross features the date 1507, and in another one the name of the leader of the weaving workshop, Pieter van Aelst (ca. 1450 – 1531/1533) can also be read. Pieter van Aelst, however, was clearly not the designer of the tapestry, only the entrepreneur carrying out the costly process of weaving. 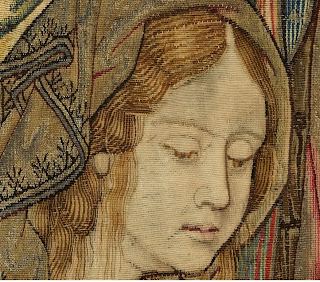 The stylistic features of the design of the tapestry point to the direction of Jan van Roome, the most prolific artist of the first two decades of the 16th century (active between 1498 and 1521). He is known as a designer of sculpture, stained glass, seals and tapestry, his most important work being the creation of the funerary chapel of Margaret of Austria in Brou. Documents reveal that he was the most important painter-designer of his time, receiving many other courtly commissions. 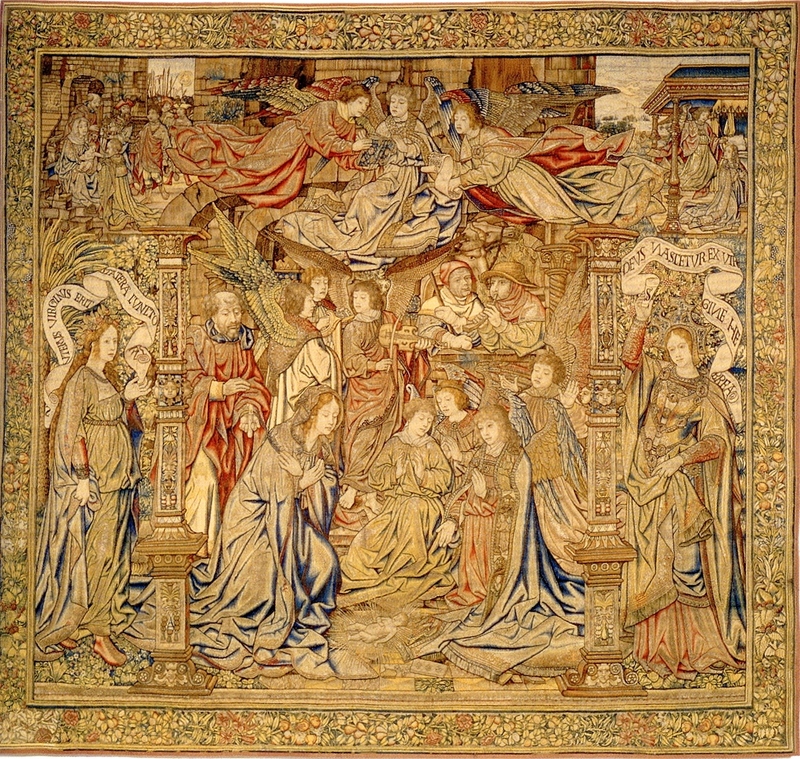 His activities as a tapestry designer are documented from 1513, when in Louvain the tapestry depicting the miraculous communion of Herkenbald was commissioned from him. Details of this magnificent work can now be studied up close in front of any computer. The resolution is truly impressive: you can even see how the gold threads were made, which give this work its particular glistening appearance. Go ahead, and browse this and other medieval treasures from Hungarian museums in the Google Art Project!